There are no photos with those IDs or post 15791 does not have any attached images! 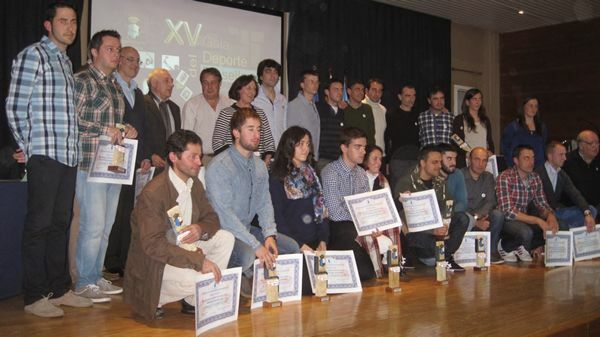 On Friday 23 of January in the House of Culture at 20,30 hours will take place the Sports Gala of Ribadesella 2015 with the delivery of the awards, decided by the jury on January 15. 2º. In order to award the prizes, in addition to the sporting merits, one must take into account having excelled in adopting attitudes and ethical-sporting behaviors, promoting and practicing the noble game without violence and demonstrating with sporting gestures. 3º. The proposals of winners in all categories will be presented by the members of the Jury or by individuals whenever they fill out the forms created for this purpose, which will be deposited in the City Council of Ribadesella and in the Municipal Sports Center. The winner will be by simple majority and, in the event of a tie, there will be a vote of quality by the President of the Jury. 4º. The candidate's presentation will be formed by the formal proposal, according to the annex that will be available to citizens in the Municipal Sports Center and in the Ribadesella City Council where the Curriculum Vitae is expressed and all the information considered necessary. It will be delivered to the Secretary of the Jury (at the municipal sports center) before or at the place and time it meets for the deliberations of choosing winners. 5º. The requirements of the candidates will be: be born, be registered or represent a Ribadesella Club and be at least Youth category (born in the year 1998 and earlier), except in sports with exceptions. For the section of best Club, Coach and Best Sport Testing Organization, all categories will be included.